It is a truth universally acknowledged that if one is writing a historical romance, one must have a heroine to root for, a hero to swoon for, and enough of something that is wholly the writer’s to let the reader know this story may have a happy ending, but that’s the only predictability you’re going to have. 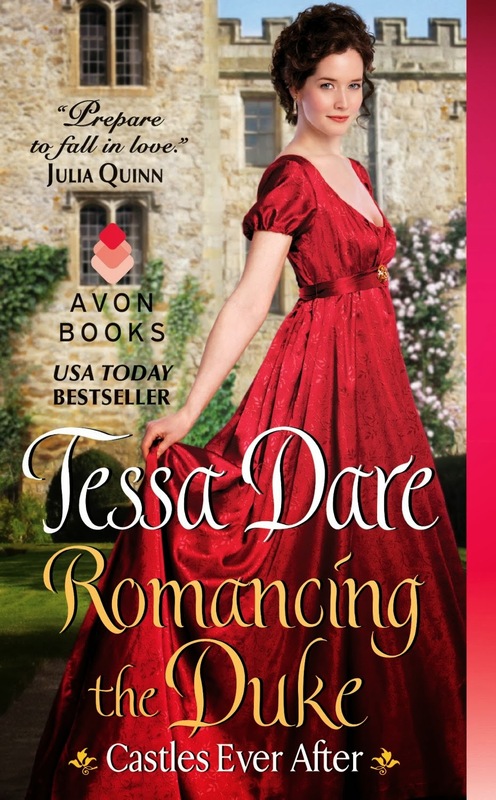 Tessa Dare’s Romancing the Duke not only meets these expectations, but exceeds them. Izzy Goodnight, penniless spinster-orphan, has inherited a castle that is currently occupied by the Duke of Rothbury, a charming man who makes the cherished fairy-tale Beast look like a diplomat. Of course, the Duke didn’t sell his castle, so he’s flummoxed how it could possibly have been inherited by Miss Goodnight, even if she’s now holding the title in her hand and there are a bunch of impressive signatures and seals all over it. They work out a truce of sorts. In exchange for some money (she is penniless and renovating this castle will not be cheap), she will be his secretary as they unravel the mounds of letters that have accumulated over the last several months while the Duke has been convalescing. Now all of that sounds completely normal, right? We’ve read and loved that story before—the poor penniless heroine who finally has caught a break, almost, but now has to deal with this big, handsome, intimidating man who frequently behaves as if he doesn’t know if he wants to break furniture or ravish her. But Ms. Dare is not satisfied with normal; and she’s really quite brilliant at adding “writer jokes” that translate wonderfully to the reader. One of those “Do Nots” of writing is “just because it’s funny to you as a writer doesn’t mean the audience will think so.” But Ms. Dare is very much able to have her cake and eat it too. And you’ll be having it and eating it too as you meet the Moranglian society, wonder who the real Izzy Goodnight really is, and gasp as you realize you’ve been Jedi’d in a 19th century England setting. To those readers who want strictly drama and romance and turmoil, they will probably pick at things in this book. The dialogue is probably not perfectly proper for the period, let alone how some of the different classes of people behave. It’s a Romp of the capital R order, but all the humorous bits didn’t take away from the darker emotional bits of the romance. He was still a duke who had never been loved; she was a penniless orphan who was beloved by everyone. They had their own baggage to sift through; they both brought what the other needed. I was thoroughly satisfied in its ending. I would give much more specific examples and quotations from the book, but that would ruin the surprise that much of the humor gives. And believe me, I want to quote plenty from this book. Let’s meet back in a week or so and pass our favorite scenes back and forth, shall we? Or if you’ve already read it and can refer to a scene without giving everything away—do share! I just read my first Tessa Dare book last year and loved it and I'm sure this one is another winner! It so totally is! I'm so excited about this new series. I swear, Dare just keeps getting better and better with every book! I so want to read this, but there are six in front of it. (I really can't skip these six.) BUT as soon as these are done, I'm reading this one. I so love Tessa's voice. I understand the pain. I think you should download it and read the opening chapter...and then use it as a carrot motivator to finish the other 6 books. I bought the audio after reading Janga's earlier review. Dare proves that she belongs in that rare company of writers like Julia Quinn who create stories with humor and heart and a contagious joy that unites author, characters, and reader in a superlative reading experience. No higher praise than that. Weird, Q, that's what my boss asks! Kidding, kidding. Mostly. This is what bluestocking single girls do. We read copiously. And there was an ice storm last weekend. Totally agree with Janga! Tessa does belong in the rare company of JQ--humor, heart, and lots and lots of joy. I felt extremely engaged as a reader and those are always the best books! Great review! I do love Tessa's books and I can't wait to read this one. This is definitely on my TBR list! Yay! It's wonderful. Please let us know what you think of it! Wonderful review, Hellie! I loved this book too and agree with everything you said. Tessa Dare became an auto-buy for me with her debut and has only strengthened that position with each subsequent novel she has published. Can't wait to read this! Lots of good reviews! It's a fun read, Sharlene. Hope you enjoy it! I liked your review! I will check into Tessa Dare's books! Laurie, you haven't read Tessa Dare yet? You have some awesome reading ahead. I recommend anything she's written! I am sooooooo looking forward to this one!!! !